Bodesi is a boutique glass tile manufacturer. We produce glass tile for kitchen backsplashes, showers and commercial installations. 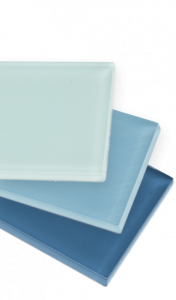 Our custom glass tile is sought out by designers, architects and design savvy homeowners. All of our tiles are made to order and are easily customizable. Browse our selection of artisan glass tile to find a perfect fit for your kitchen or bathroom. Whether you want blue, green, gray, white, brown or a combination of warmer shades, our hand painted glass tiles are created with quality at the forefront of the entire process. The end result for us is handcrafted tiles that inspire the fresh looks and unique designs of a truly artisan product. Subtle variations from tile to tile make our hand painted tiles ones that you will never stop admiring. Our Spectrum series of solid colors offers a wide spectrum of hues in varying tints. 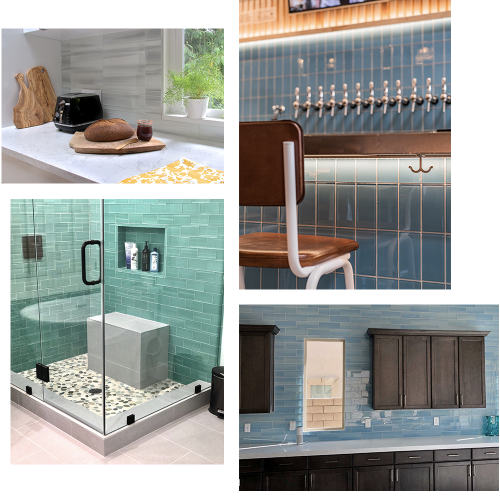 View our gallery of projects featuring our handmade glass tile. "We purchased this for our kitchen and have not been the least bit disappointed. After working with us for several weeks to find the right color combination for our kitchen, Bodesi helped us choose this. We love it. We would purchase from this seller again. The items arrived in great packaging with no damage and on time. Love it!" "OUTSTANDING! Creative, professional, great value! Bodesi created a custom tile to match the background of my wallpaper and it is perfect! They were a delight to work with too. I could not be happier and look forward to working with Bodesi on my next project. Just beautiful!" "I have had nothing but compliments on the look of this tile. If you want a look that you can not find through the bulk stores, these hand painted, every tile unique, glass tiles are perfect." "I absolutely love my tiles. My kitchen has never looked better." "I absolutely love the tile, it’s one of my favorite things of the remodel!!" "Our realtor said everyone was gawking at the backsplash during the open house."